Bethany Town Hall is located at 326 Church Street, Bethany, WV 26032; phone: 304-829-4217. Photo: Alexander Campbell Mansion, ca. 1811, Route 67, Bethany, WV. Listed on the National Register of Historic Places in 1970. 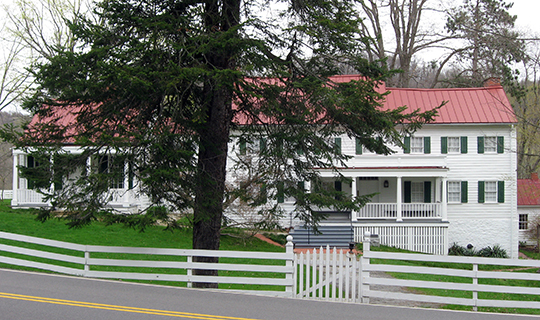 Designated as a National Historic Landmark in 1994. Photographed by User:Nyttend (own work), 2011, [cc-by-1.0 (creativecommons.org/publicdomain/zero/1.0/deed.en)], via Wikimedia Commons, accessed January, 2014. Bethany's origins pre-date the creation of the State of West Virginia, when Brooke County was still a part of Virginia. On June 2, 1827, the settlement of Buffalo, located in Buffalo Township, Brooke County, Virginia, became a postal district named Bethany by its first postmaster, Alexander Campbell. The settlement expanded, centering primarily around the various enterprises of Alexander Campbell, founder of Bethany College, which was chartered by the Commonwealth of Virginia on March 2, 1840. In order to encourage the building of private residences for use as boarding houses on land adjoining the college, on June 30, 1846, Campbell submitted to the board of trustees a plot laying out a grid of streets, alleys, and lots for their consideration. He filed this plan at the county seat located in Wellsburg on August 8, 1848. On April 6, 1853, the Town of Bethany was chartered by the Commonwealth of Virginia. The town selected Amos Emerson Dolbear to serve as its first mayor in the spring of 1871. Town of Bethany, West Virginia, Comprehensive Plan, 2008, www.bethanywv.net, accessed January, 2014.